FixWix Curtain Fixing Dubai, are the professionals who knows how to measure and hang curtains. If you are not sure how to fit new curtains and you need a hassle free solution then contact us? We will fit your curtain track and pole in very professional way. Measure up for curtain poles and tracks? Curtains and blinds block out light and flow of air, as well as providing you with extra privateness. However they can even be an exclusive design characteristic – introducing colour, pattern and texture into any room for your dwelling. Curtain tracks and poles, too, come in numerous one of a kind design to go well with each type of inside. If you’re planning to buy a ready-made curtains it is an excellent idea to prefer them before you buy your track or pole. You will find out some curtains are designed to be hung from a particular type of fitting and it will make easy for you to decide after words. We have a exclusive range of curtain tracks and rails. These tracks and rails can be fixed to a ceiling or the top of a window. 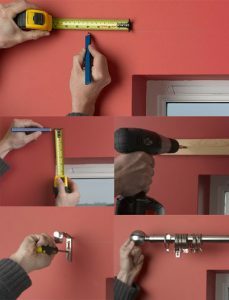 We have solution for windows with limited or no fitting/fixing space on the walls. FixWix curtain fixing Dubai has professionals who can recommend tracks for different weights of curtains. These all options have the ability for fixing to a ceiling or the top of a window frame. FixWix Curtain fixing dubai have rails for different type of curtains, rather thay are light weight or heavy weight theatrical curtains with heavy interlining. We have top brands ceiling tracks available. If you require any help or advice from our professionals please contact us on +971 50 106 3309 and a friendly member of our team will be happy to help you.